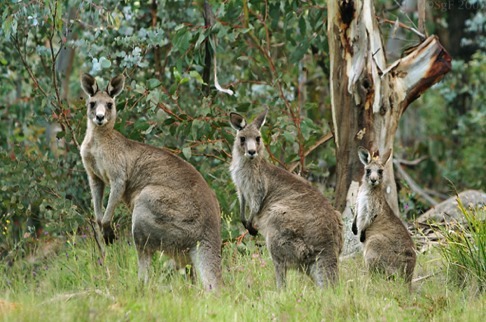 The Eastern Grey Kangaroo (Macropus Giganteus) is Australia’s second largest and heaviest marsupial and native land animal. An adult male can weigh up to 66kg. The Red Kangaroo is the biggest with a weight of up to 85kg. The Eastern Grey prefers open grassland and areas of bush for daytime shelter. They are nocturnal and crepuscular (active during dawn and dusk). Being very adaptable to a wide range of conditions in the local environment, their population has increased significantly in the Warby Range area. The Black Wallaby (Wallabia Bicolor) is also known as the Swamp Wallaby. It inhabits undergrowth in forests and woodlands, sheltering during the day and emerging at night to feed. 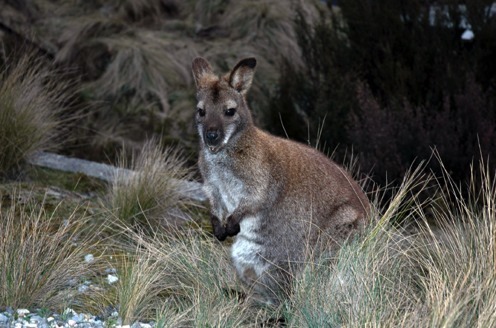 Unlike the kangaroo, the black wallaby is a solitary animal, only aggregating when feeding. The weight of an adult male is approximately 17kg.